How to find real experts to install a vinyl floor? With Prosco’s help, it's easy! Call now and we’ll connect you with the best people for the job! We will connect you with the very best flooring company in your area who will have no problem installing a vinyl floor at your place at a very competitive rate. We guarantee that you will not get ripped off by the contractors for any of these services. To be sure the job will be done professionally and at a reasonable rate, make sure to call Prosco right away! There are two common types of vinyl flooring. The first one is vinyl sheet flooring, which is pretty easy to install. However, most people prefer vinyl tile flooring for their homes. This type of flooring looks exactly like ceramic or stone tile flooring but costs much less. The problem, however, is that vinyl tile floors aren’t that easy to install. The person installing them needs to be experienced in this kind of work. Otherwise, you might end up with tile floor that will not only look ugly but also leak water. To prevent that, the best thing you can do is give Prosco a call. Just tell our agents where you’re located and they’ll connect you to professional flooring contractor who will be able to take care of this easily. Apart from being able to install vinyl floors flawlessly, companies that work with Prosco will do it at a very affordable rate. Each contractor that Prosco recommends is in this business not to get rich overnight but to actually help people. All of companies Prosco recommends have been in the business for a long time and have a huge number of satisfied clients. This means that the chances that you will be displeased with their services are close to zero. Once you give us a call and explain to our phone operators what kind of flooring job you need, they will give you a rough estimate of the cost. Then it’s up to you to decide whether you want to hire the contractors that we recommend. Of course, the estimate we give might not match the contractor’s estimates exactly. However, the experience has shown that the two estimates usually do not differ much. Installing vinyl floors isn’t the only thing you can ask Prosco’s help with. We can help you find the right company in your area who can repair your flooring, regardless of how difficult the problem might seem. The problems listed above are some of the most common issues people have with vinyl flooring. Of course, even if the problem that’s been bothering you is not on the list, it doesn’t mean that Prosco’s recommended flooring companies will not be able to solve it. You can think of vinyl as a synthetic version of linoleum, which is more durable and more resistant to stains and water. Actually, how water-resistant vinyl floor will depend not only on its quality but also on the quality of installation. That brings us back to the importance of hiring the right people for the installation job. Installed properly, a vinyl floor can be used for many years, without causing you any problems. Because this type of flooring is very sturdy and durable, it’s often the preferred choice for offices and other areas with heavy foot traffic. Of course, this doesn’t mean that vinyl flooring isn’t a suitable choice for homes. Actually, it’s just the contrary. Vinyl floors feel very comfortable under feet and on top of that, they also reduce the footstep noise levels. For that reason, you definitely need to consider getting such a floor for your bedroom or bathroom. Another reason why vinyl flooring might be your best choice is that this material is pretty cheap, at least compared to many other types of flooring. Furthermore, you can find all sorts of vinyl floor designs, including those that resemble hardwood flooring. 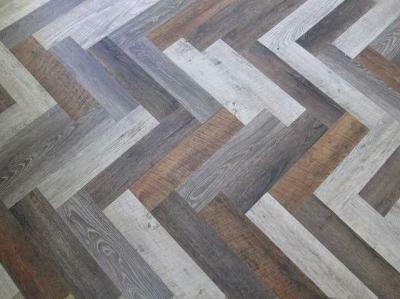 In fact, some of them are so similar to wooden parquetry that you will struggle to spot a difference from a distance. If you’re still not sure whether vinyl flooring is the right choice for your place, you can ask experts for an opinion. Just give a call to Prosco and our agents will connect you with friendly flooring professionals who will be glad to share their thoughts with you. Yours is just to tell them everything about your flooring needs and wishes, after which they will probably be able to tell you which type of floor is your best choice. Even better, they can come round your house and take a look in person. This way, they will be able to give you a suggestion, as well as provide you with all the info about the installation cost, time that’s needed for installation, and so on. If you decide to have a vinyl floor installed in your home or office, give a call to Prosco and we’ll help you find the right people for the job!